Contra trading is an activity that allows the buyer to contra or offset its buying obligation (purchase of shares) with its broker before the settlement/maturity of the contract. The benefit of contra is that it enables the buyer to exit the contract early. The end result of contra is the netting off between the amount the broker is obliged to pay to the original seller for the price of the shares and the amount the broker received from the new buyer for the price of the shares. 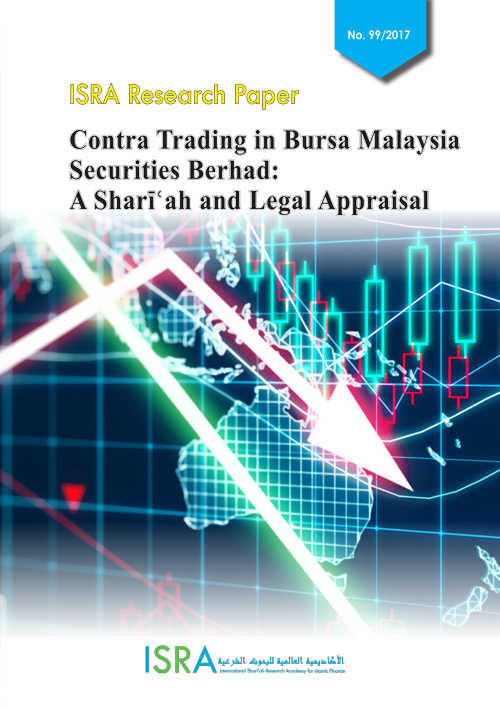 This paper investigates the practice of contra trading at the Bursa Malaysia from the Sharīʿah and legal perspective. The information on the practice was garnered from a series of meetings and discussions held with the Islamic capital market, legal, trading, clearing and settlement departments in Bursa Malaysia Berhad. Seven Sharīʿah issues are discussed in depth in this paper. The first issue is about the ownership of the shares between the time of the purchase and the settlement day. The question is whether, at the time the buyer enters into the contra trading, the buyer is already the real owner of the shares and thus entitled to sell them. From the Sharīʿah perspective, for the shares to be transferred and owned by the buyer, the Contract Note must fulfil the requirements of a valid contract. The underlying principle is that ownership of the subject matter of a sale transfers to the buyer upon the conclusion of the sale contract regardless of whether the subject of sale has been delivered to the buyer or the price has been paid to the seller. The discussion of the issue of ownership refers also to the position of the law, which raises some predicaments with respect to the limitation of the buyer’s right over the shares. Sharīʿah point of view as the permissibility of contra trading revolves around them. On the issue of possession, the authors consider shares to represent the holder’s ownership of the company’s capital and the rights associated with it; thus owning shares could never be by physical possession. Therefore in the case of buying and selling shares, the possession involved is argued to be constructive. The question that follows this proposition is whether the purchaser has constructively taken the shares into his possession on the transaction day; i.e., T+0? In general, constructive possession is attained by leaving the commodity at the buyer’s disposal (takhliyah) and enabling him to deal with it as he wills (tamkīn). Therefore, the liability for loss of the asset will transfer to the person who has taken the asset into his constructive possession. Based on this, the paper argues that “takhliyah” and “tamkīn”, which the jurists mention for constructive possession, are not fulfilled before the delivery of the shares on T+3, as the buyer has not been given any power over the shares or access to the shares except the ability of the buyer to sell the shares. A mere legal right to sell the shares and to gain profit from the sale does not suffice to constitute constructive possession for the buyer. Thus the benefits and liabilities of the asset (i.e., the underlying company) are still vested with the original seller. Additionally, the paper further argues that being legally allowed to sell an asset and being exposed to its price movement does not at all mean that the liability of the asset has actually transferred to the buyer. The fourth issue is whether contra trading involves the element of taʾjīl al-badalayn (deferment of both counter-values). The paper views that in taʾjīl al-badalayn the issue is not about when the transaction takes place but when the subject matter is delivered and the price settled. This will only happen and appear in the accounts of both parties three days after the transaction. Thus the three-day delay for the delivery of both counter-values could be a conclusion that share trading does involve taʾjīl al-badalayn. However, the paper takes the view of the Mālikīs that the three-day deferment can be deemed as minor and tolerable. In addition, the three-day deferment in shares trading has been accepted as the international industry convention that could constitute a strong basis of need (ḥājah) that justifies a relaxation of the general prohibition of taʾjīl al-badalayn. The fifth issue is the prohibition of selling something before taking it into possession; i.e., whether the prohibition is general or restricted to food items. The authors support the view that it is restricted, and since shares are clearly not food items, selling them before taking them into one’s possession is permissible. jurists, when one does not fulfil those conditions, the buyer’s profiting from something for which he has not yet borne liability is prohibited. argues that contra is not between two parties that are betting on the same bet, which will end up with one of them winning and the other losing. Instead, contra is about selling an asset at the market price, and the other party may want to keep the shares for a long-term investment because the price may keep on increasing. The study concludes that contra trading involves a real sale and purchase of shares. It further concludes that, from the Sharīʿah perspective, irrespective of the legal requirement for the share’s legal ownership, at the time when contra trading is executed the contra trader is the real owner of the shares upon which he onward sells the shares to a third party. The reason is that the purchase transaction done by the contra trader fulfils all the pillars and conditions of a valid sale and purchase transaction. With regards to the issue of delivery and possession of shares as well as the transfer of liability of shares during the onward sale, contrary to the stance of AAOIFI, this paper found that the shares have not been taken into the possession of the contra trader, neither physically nor constructively. This paper further found that the liability of shares has not been transferred to the contra trader. On the issue of deferment of both counter-values, which many scholars, as well as AAOIFI, do not allow, this paper found that it is not a fundamental issue in Sharīʿah. It is further viewed that the deferment of three days can be considered minor hence tolerable. Related to this issue is the issue of possession and transfer of liability of shares before possession. Based on the views of many Muslim scholars that allow selling before possessing the sold item so long as the item is not food, the paper, therefore, concludes that selling of shares before the buyer possesses the same is allowed. interest (maṣlaḥah) and need (ḥājah). Finally, the paper concludes that there is no element of gambling in contra trading. The reason for this is that the broker in contra trading will always make a profit, not from the price movement but from the brokerage fee. There is a fee when a trader purchases shares and on the occasion of contra, regardless of whether the onward sale results in a profit or a loss. The paper argues further that it is a normal risk for any trader to gain profit when the price moves in his favour and suffer loss when it moves against. original seller and the subsequent onward sellers, shall collectively pay compensation and charges to the ultimate buyer on a pro rata basis, according to their earned profit. Secondly, the paper recommends that further empirical and quantitative studies be carried out in future for the purpose of ascertaining the extent of the public need for contra trading and the real benefits that contra trading brings to the society. These studies will serve as indicators whether contra trading deserves a relaxation from the strict Sharīʿah ruling and, if positive, would affirm its permissibility. contra trading, shares, ownership, possession, liability, profit, Sharīʿah ruling.